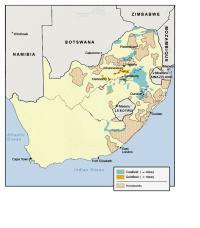 This map shows the boundaries of the ten homelands or Bantustans along with the location of land that can be used for agriculture. 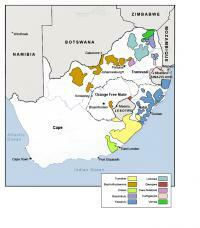 The territory designated for ten African "homelands" is shown with deposits of gold and coal and the existing mines. 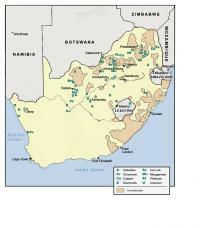 This map shows the territory of the ten homelands designated by the apartheid government along with the major industrial areas and ports. This map shows the boundaries of the homelands along with mineral deposits, other than gold and coal. 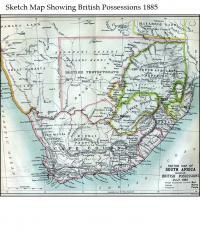 Map showing British, German, and Portuguese possessions in 1885. 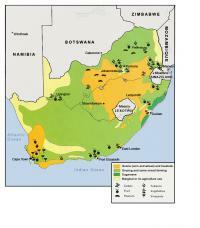 Agricultural land and major commercial crops are shown here. 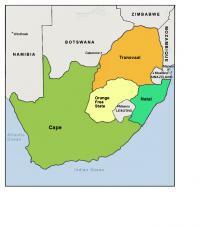 The four provinces in South Africa during the apartheid era. 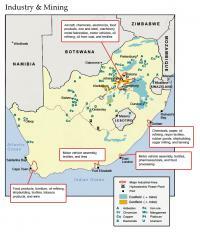 Major industrial areas, including mining, and the six major ports are shown here. 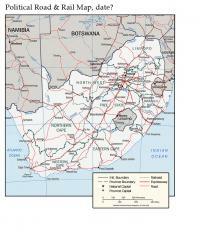 Provinces and major cities, roads, and railways are shown in South Africa and into neighboring countries. 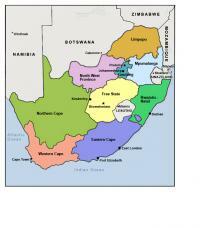 Major cities and provinces in post-apartheid South Africa. 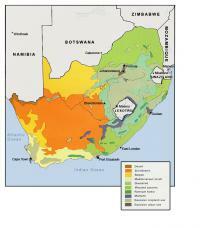 This map shows the diverse forms of vegetation in different parts of South Africa.